A screen grab from FBI's Most Wanted website taken May 2, 2011 shows the status of Osama bin Laden as deceased. Al Qaeda leader Osama bin Laden waskilled in a U.S. helicopter raid on a mansion near the Pakistani capital Islamabad early on Monday, officials said, ending a nearly 10-year worldwide hunt for the mastermind of the Sept. 11 attacks. 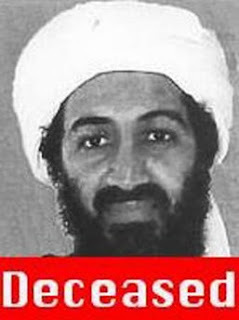 U.S. officials said bin Laden was found in a million-dollar compound in the military garrison town of Abbottabad, 60 km (35 miles) north of Islamabad. After 40 minutes of fighting, bin Laden was among several people in the mansion killed. A source familiar with the operation said bin Laden was shot in the head. Head shot, eh. From my familiarity with horror films, I understand that's the only thing that'll take down a zombie, which is what bin Laden had been for the past ten years, a dead man walking. To be honest, I'd half-figured that he was already dead past any walking since we'd heard so little from him since 9/11, and the few words attributed to the man were so out of touch that he scarcely seemed alive. I find celebration difficult, and not merely because I know that we'll be inundated with conspiracy theories about how this wasn't really bin Laden but more because I know that this war against Islamist jihadis is far from over . . . I honestly don't think it was a good idea. The myth of Obama bin Laden was created by the US propaganda, but surely jihadis didn't ask for his permission / counselling, or anybody else's, before planning an attack. And won't, of course. That's very different from Hitler's case: he really was the "Guide" of a nation. After his suicide, Germany wanted to discuss the terms of surrender with the Allies, but at the beginning there was a problem, right because no 'official authority' existed any more. In this case, however, no organization will lose a head, except symbolically; and nobody will surrender. After changing bin Laden into a dark hero, the US are likely to change him into a dark martyr. They probably needed to 'show' something to the crowds... that's politically understandable, but it would be better to develop long-term policies. It won't happen, however, as long as Economy will be the basic criterion for international choices. Economy is half-blind, but it works as a strange drug: it makes people feel clever when they are not. It's like one of Kant's aporias, Dario. There was no good choice. Either way, the Islamist jihadis would find reason to celebrate. Yep. The whole world / existence is like that. Or "electronic muster" . . . I had discounted his ability to lead for many years, but where they found him makes me question that view now. Scott A., agreed. Bin Laden had to be found and brought -- or, as turned out, sent -- to justice. LeRoy Tucker's Short Story "Barbershop"
Eric Li on "Modernism" and "Modernization"